Old Basford School is a member of the Transform Trust Teaching School Alliance. Schools supported by Transform will have access to education expertise, support and experience from across the growing Teaching School Alliance. Within the Alliance is a core school improvement capability of 5 National Leaders of Education, 9 Local Leaders of Education, 2 National Leaders of Governance, 18 Specialist Leaders of Education, as well as 24 ITP/OTP facilitators and 5 Ofsted trained inspectors (AI). Staff are able to access a range of opportunities and professional development programmes to develop high quality learning and teaching. Middle and Senior Leaders Development Programme, Bespoke Leadership Courses, Bespoke Coaching Programmes, NQT and recently Qualified Teacher Training, Subject Specific Networks and Year Group Networks. Schools that form the Primary 6 Partnership are Heathfield, Hempshill Hall, Old Basford, Rosslyn Park Primary Schools, a mix of maintained schools and academies. The partnership emerged from an existing family of schools with strong historical relationships. 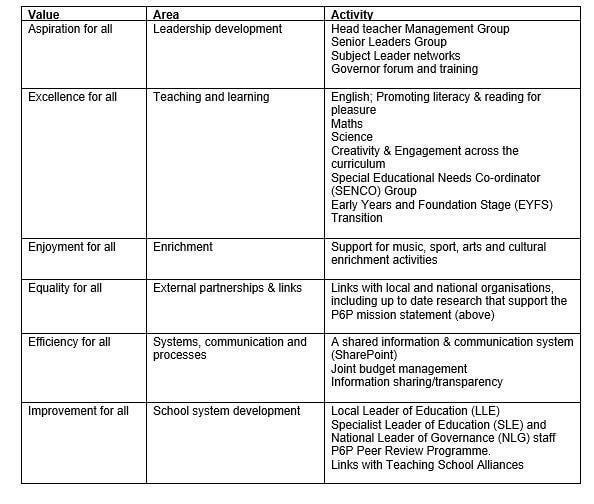 As five schools operating across six sites serving over 2,500 children, we collaborate on six key areas. For 2017/18 we are delighted to be the 'Lead Partnership Schools' working with the Royal Shakespeare Company and the Theatre Royal Nottingham to provide high quality training for staff and a wide range of opportunities for pupils as we embed Shakespeare texts into the curriculum. We will build a larger partnership of 10-12 schools from across the City to be part of this exciting collaboration. The P6P was one of only 15 schools nationwide to receive funding to operate as an Enthuse Partnership to promote STEM (Science, Technology, Engineering & Maths). We are focusing this funding over the next two years on work with our Year 4 pupils and staff to impact upon the progress and attainment of all children and particularly those for whom pupil premium funding is relevant. Gary Fullwood, P6P Chair and Executive Head teacher of Heathfield Primary & Nursery School. ​In the P6P we are using this funding to support work in Year 4 and will be providing high quality science training for Year 4 staff in each school, including joint activities over the next two years. We will be particularly supporting the leadership of our science subject leaders as well as developing our Year 4 class teachers. Part of our work will include a joint Year 4 Science Festival in March 2018 and increasing our links with local industries. Through this project we hope all children will be enthusiastic about science and expect progress and attainment in science to improve for all and for children eligible for the pupil premium grant in particular. We are pleased to be working with our local Science Learning Partnership, Ellis Guilford Secondary School and Basford Hall College as well as other partners like STEM Ambassadors along the way.